Product prices and availability are accurate as of 2019-03-27 00:45:06 EDT and are subject to change. Any price and availability information displayed on http://www.amazon.com/ at the time of purchase will apply to the purchase of this product. 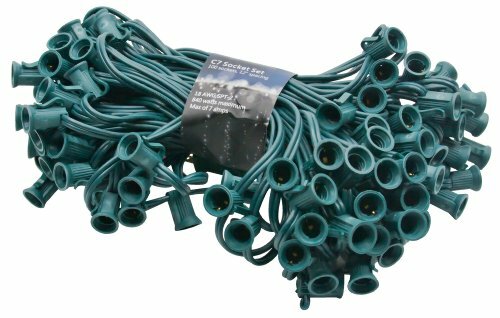 American Lighting XC710012-GR Seasonal Lighting Stringer for C7 Bulbs, Green, 100-Foot. 18 AWG SPT2 wire on bulk reel - rated for 10 amps to allow longer runs. Use ultra-long-life LED retrofit bulbs to run longer lengths with up to 500 sockets. Includes a factory installed fused plug. Available in green and white wire for a variety of applications - 25, 50, and 100-foot lengths. UL listed for indoor and outdoor use.